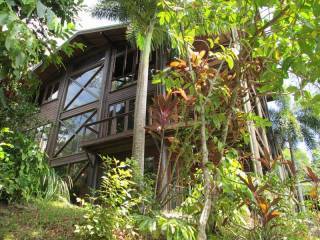 Wait-a-While Daintree in Daintree, Cape Tribulation is one of the largest single dwellings ever constructed in the Daintree Rainforest. 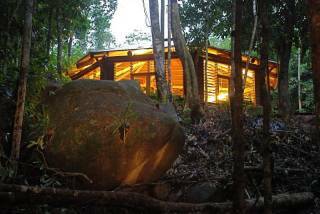 Designed by award-winning, South-African architect Gavin Paddock, and modelled on the traditional New Guinean long-house, Wait-a-While Daintree provides almost 500 square metres of living space. The building, completed in 1993, contains more than 100 tonnes of timber and is finished with materials sourced from southern Queensland, South Africa, Kashmir, New Guinea and the United States. 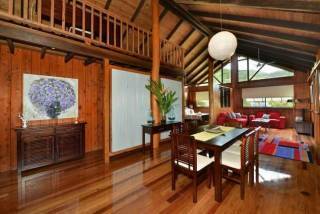 Comfortably sleeping 9 guests, the property has 3 bedrooms downstairs consisting of 2 x king bedrooms plus a bedroom that has 2 king singles and a trundle pullout. Upstairs on the mezzanine level there is a queen bed. There are 2 bathrooms inside the house, as well as a shower outside by the pool. 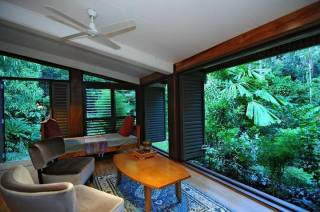 Daintree Accommodation facility is situated at Cow Bay, approximately 30 minutes north of the Daintree River, Wait-A-While Daintree provides easy access to the Daintree National Park and Cape Tribulation region.